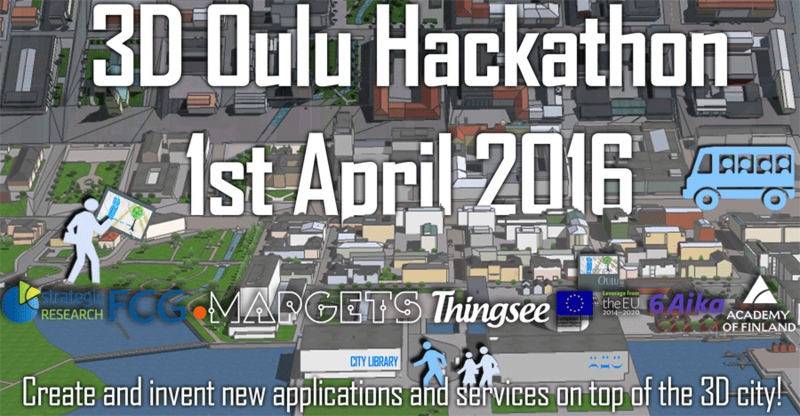 3D Oulu hackathon (1-3. Apr. 2016) is an event for creating and inventing new applications and services on top of the 3D city. The event is suited to both experienced and less experienced developers and designers. Recruitment is targeted towards both students and professionals. Best projects on both tracks are rewarded with a 100€ gift voucher for each member in the winning group. Snacks and one warm meal (pizza) will be provided on location for the registered participants. We offer some hardware support and the possibility to utilize devices like VR goggles and Thingsee devices for you applications (if you want to use them), but each participant or at least one person in a team is assumed to have a laptop. Guidance on the used technologies and software is provided by the event organisers. The members in the winning team will be rewarded. In the following are examples of open data sources that area available for you to use in your projects. You can also use other data sources (for instance Thingsee devices). Do not let the available open data restrict you too much.